I love gyros. I love watching the cooks shave off pieces of the tender lamb from the… meat cone or whatever you might call it. This time, I tried making my own at home. I chose to make the pita versus buying it, but if you’re looking to save some time then by all means use a pocketless pita from the grocery store! The entire process took me just under two hours, but the results were so worth it. My schedule was like this: marinate chicken and refrigerate, mix dough for pita and let rise for 30 minutes, make tzatziki while waiting for chicken and dough. 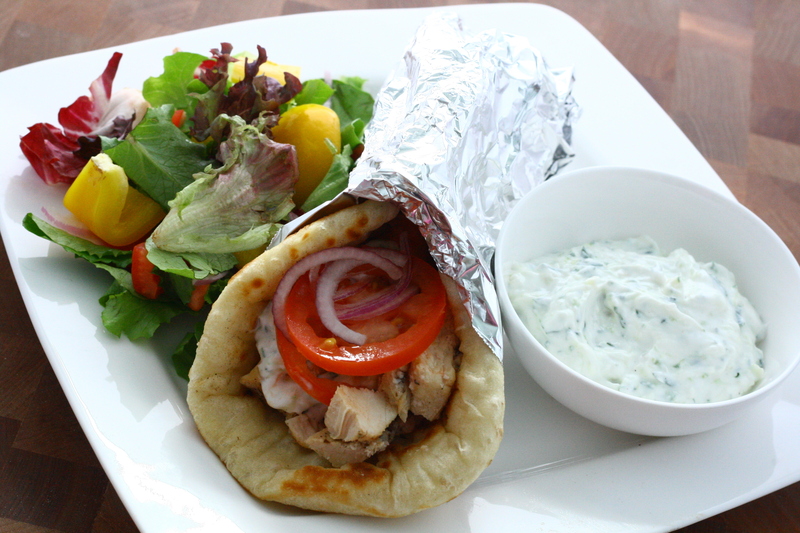 Refrigerate finished tzatziki, roll out dough for pita, cook chicken and pita simultaneously. In between flipping pitas, slice tomatoes and onions. Assemble and serve. Sure, it’s quite a bit of multitasking, but I think I made pretty good use of my time and when I got around to assembling, the chicken was still piping hot and the pitas were perfectly warm. The best part? I had all ingredients on hand already. Yes, I do keep a huge tub of Greek yogurt in my fridge at all times. Make a marinade for the chicken by whisking together garlic, lemon juice, vinegar, oil, yogurt, oregano, salt and pepper in a large bowl. Add the chicken and rub the marinade in. Cover and refrigerate for 1 hour. Heat a large nonstick pan over medium heat and lightly coat with olive oil. Brown chicken on both sides and cook until juices run clear, about 4 – 6 minutes per side. Let rest before slicing into strips. To make the tzatziki: shred or grate the cucumbers and squeeze excess moisture out. Make sure to get as much liquid out as possible! Mix together yogurt, cucumbers, garlic, vinegar, lemon juice, salt and pepper. Refrigerate at least 30 minutes before serving to allow flavors to meld. To make the pitas: in a large bowl, mix together yeast, salt, sugar, olive and water and let stand for 5 minutes or until top is foamy. Using your hands, gradually add in flour 1/2 cup at a time to the wet ingredients. Knead until dough pulls away from the sides of the bowl. Cover with a damp towel and let rise in a warm spot for 30 minutes. 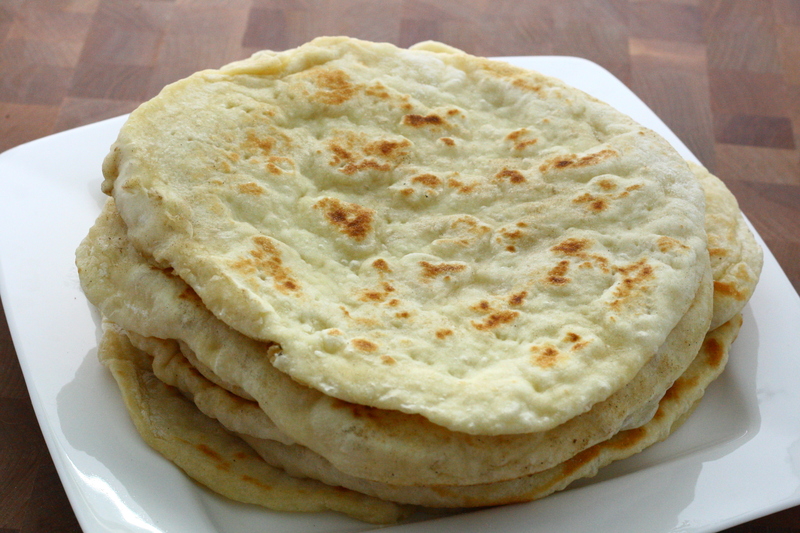 Divide dough into 6 pieces and roll out on a floured surface into 8-inch rounds about 1/4 inch thick. Lightly poke the surface with the tines of a fork, being careful not to poke through the dough. Heat a large cast iron skillet over medium-high heat. Lightly coat the skillet with oil and place one dough round into the skillet and fry the bread until it starts to puff and bubble, about 1 – 2 minutes. Flip and fry the other side. Repeat with remaining dough. 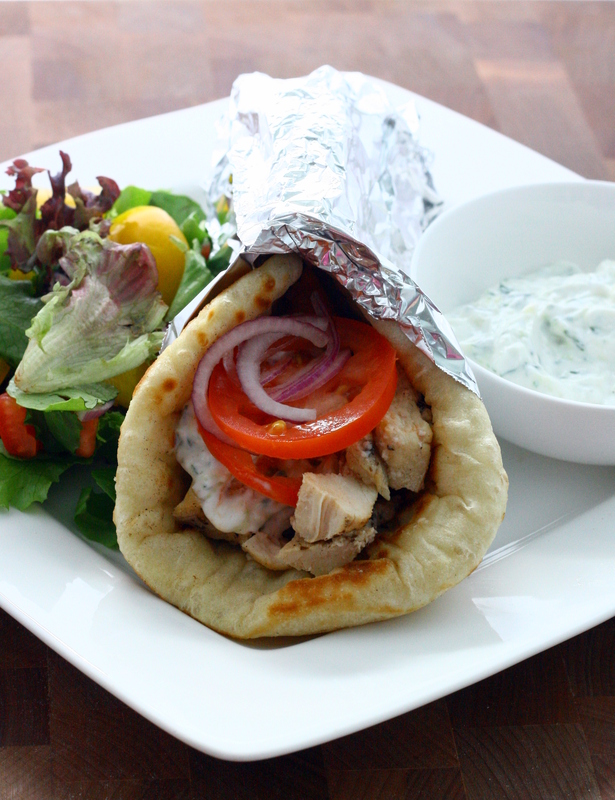 Assemble gyros by piling a pita with chicken, tzatziki sauce, tomatoes, and onions. Enjoy! Categories: Bread, Muffins & Rolls, Chicken, Main Entrees, Meat | Tags: bread, chicken, main dish, meat | Permalink. I love gyros, these look great, and not to mention your pictures have me drooling! Beautiful!